Ambassador Katureebe Tayebwa ; Consul General (right) , Hon. 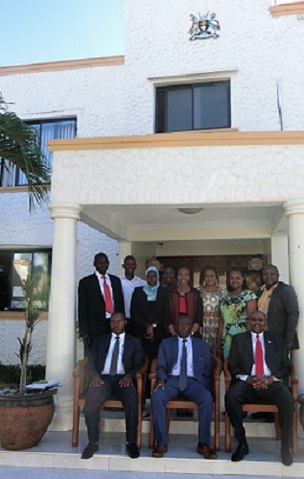 Katuramu Hood Kiribedda(Chairperson) (centre)together with the Committee on Foreign Affairs and members of staff of the Consulate. The Parliamentary Committee on Foreign Affairs made an oversight visit to the Consulate from 8th - 11th November, 2018. The Committee interacted with the Consulate on it's work. The Committee comprised of Hon. Katuramu Hood Kiribedda (Chairperson), Hon. Katali Loy, Hon.Twinamasko Onesmus , Hon. Ocen Peter. and other members of staff from Parliament.